Marijuana has been the topic of debate in many state legislations recently, leading to marijuana being legalized for medical and recreational purposes in at least 23 different American states, according to ProCon.org. With marijuana as the hot topic in many of new places across the country, and with laws becoming more relaxed, many question if marijuana should be considered safe enough to be legalized completely. While it may seem that relaxed laws must mean that marijuana is not as dangerous as once believed, the use of this psychoactive drug does have its own set of dangers and concerns. Marijuana, also known as the plant Cannabis, is smoked, ingested, and even used in some pharmaceuticals. It is classified as a psychoactive drug because when used, it causes psychoactive changes, such as a feeling of euphoria or relaxed state. It has physiological effects as well. Even though the drug is proven to be effective for certain ailments, ranging from muscle control problems to inflammation, use of marijuana for recreational purposes without close medical supervision can be quite dangerous - even just one time. To understand why, you must first take a look at the various effects marijuana can have on your body and mind. Why Does My Chest Hurt After Smoking Weed? Beyond the concrete dangers that come along with using marijuana, some people fear most the sociological dangers. Even though some laws concerning marijuana are being relaxed in some states, not everyone is on board. A study introduced by the Pew Research Center shows that about 44 percent of people believe marijuana should stay illegal. Their reasons for this opinion range from the fact marijuana is a harmful drug to the belief marijuana could be considered a gateway drug. 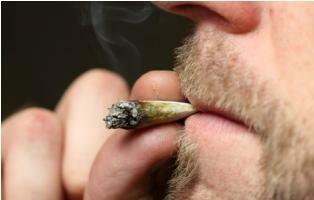 Fears that marijuana is being portrayed as less of a drug are not without warrant. A report by CNN brought to light that the country has been down similar paths when it comes to harmful substances. Tobacco, for example, is one drug that is readily available, perfectly legal, and incredibly dangerous. Yet, the U.S. is taking steps to legalize another harmful substance all future generations will have consequences with which to contend. With marijuana being more accepted, it is bound to be easier for children and young adults to access. According to some studies, the younger age a person is when he or she starts using marijuana, the greater the risks of developing an addiction. Plus, the longer anyone uses the drug, the more dangerous it becomes for their mental and physical health. Are the Risks Worth the Changes? When you take a look at all the potential dangers that come along with marijuana use, most would likely reach the conclusion that full legalization would not be worth the inevitable risks. It is true marijuana could be beneficial in the medical community for some patients, but taking steps to allow recreational use does bring about dangers that should be heavily considered.